Political stability and positive economic reforms in China and India are resulting in more and better investment opportunities. Financial technology is providing a long growth runway for Chinese technology giants. 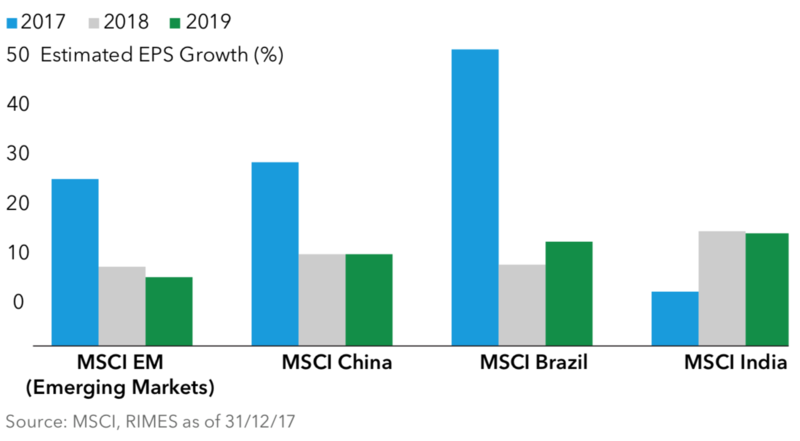 Additionally, recent reforms should strengthen India’s economy and help drive corporate profits with selectivity proving key to this stage of the rebound in emerging markets equities. My colleague Chris Thomsen is optimistic in answering questions about the future of emerging markets. What is your outlook for emerging markets equities? Emerging markets have rebounded strongly since January 2016, but I am convinced that there is more room to run. These markets have lagged developed countries since their last golden period of 2003 to 2007, and I see several encouraging signs that could drive returns for companies that do business in the developing world. The political stability and positive economic reforms we are seeing under President Xi Jinping in China and Prime Minister Narendra Modi in India – two of the biggest growth engines in emerging markets – are resulting in greater investment opportunities and higher quality GDP growth. In Latin America, I believe the worst is over for Brazil. Inflation is falling, interest rates are being cut and we may finally see key pension reforms enacted. Overall, developing countries are benefiting from an expanding global economy, rising commodity prices and moderating dollar strength. 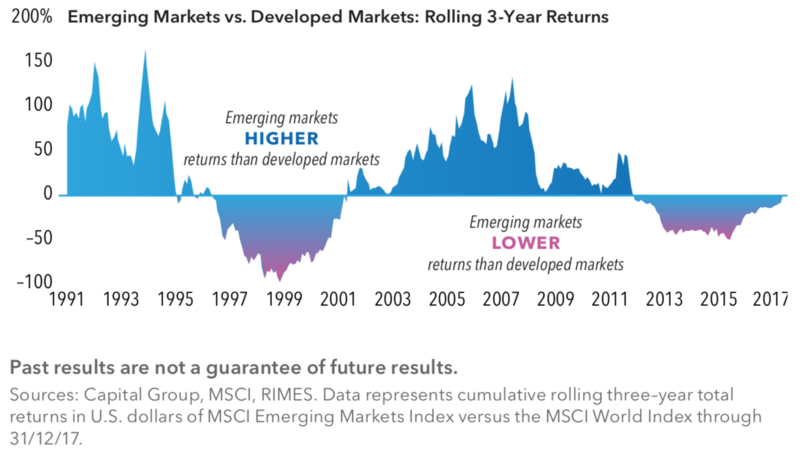 A synchronized global recovery is ideal for emerging markets, similar to the solid equity returns for the asset class during the 2003 to 2007 period. on emerging markets, in addition to geopolitical events that can be hard to forecast. It’s one of the reasons that I think it’s very important right now to be a bottom–up stock investor in emerging markets. My portfolio is very concentrated and focused on specific themes within the developing world. What themes are you focused on? 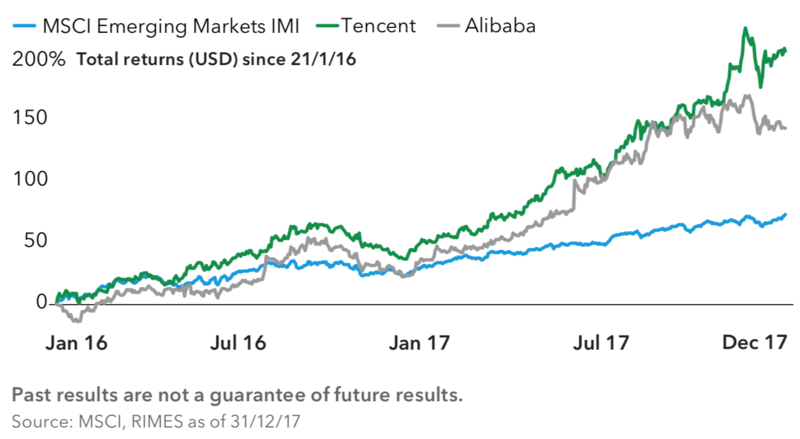 I’ve been invested in the Chinese Internet space for many years, but I am cognizant of valuations given the stellar returns for certain companies over the past 12 months. The Chinese Internet sector has consolidated into three main companies with limited foreign competition, the so–called BATS: Baidu, Alibaba and Tencent. These dominant companies are profitable and are becoming even more dominant through acquisitions. They are also incredibly innovative and have developed applications that have ingrained them into almost every aspect of a person’s daily life. For example, financial tech presents a long runway of growth for these companies. Alibaba and Tencent are driving global innovation in mobile payment platforms. In my recent travels to China, I’ve met young people who go months without using cash. Most people probably don’t know that Alibaba already operates one of the world’s largest money market funds. Recently, I’ve increased my investments in banks across India, China and Brazil. In India, I’ve historically had large positions in the private sector banks, which had superior management and returns, but the new bankruptcy law and balance sheet clean–up of the public sector banks should drive returns and a rerating for these entities. In China, the government is cleaning up the shadow banking system and the improved profitability of the state–owned banks should reduce bad debts; furthermore, valuations and dividend yields are very attractive. Brazil’s banking industry is consolidated, with attractive returns and excellent management, and the economy seems to be on the road to recovery after a deep depression. Finally, copper and iron ore prices seem to have bottomed due to a global synchronized recovery driving demand and multiyear underinvestment impacting supply. Current spot prices are expected to drive significant free cash flow and balance sheet deleveraging for resource companies, so I have been increasing my investments in this area over the past year. How are you trying to benefit from the rising consumer class in emerging markets? Asia is a particular focus for my consumer ideas due to the attractive growth profile of personal incomes and gross domestic product, high savings rates, and the absolute size of the emerging middle class. This is not an undiscovered theme, and valuations need to be carefully evaluated. I really appreciate that Capital Group’s New World strategy gives me the flexibility to invest in the exciting growth potential of the region through both local companies and multinationals. slump due to the Chinese government’s anti–corruption campaign. There are many attractive global companies that have incredible emerging markets positions after decades of investment, and they generally can be bought at very appealing equity valuations. Hong Kong–listed AIA is the dominant life insurance company across almost every Asian market, tapping into the emerging middle class’s desire for retirement products. The demand for luxury products is an attractive theme that can really only be invested in via global companies. Examples include companies based in France: Kering, which owns Gucci, and Pernod Ricard, which has incredibly strong market positions in India and China for its cognac and whiskey. Equity valuations in India are rich compared with other emerging markets. Is this a concern? I remain bullish on India. It is home to many extremely well–run companies with high returns on capital, strong balance sheets and established market positions. Quality franchises with superior management and attractive long–term growth profiles are rarely cheap. I’ve been an investor for many years in certain private banks. Some look expensive on a price–to–book basis but have generated superior returns and still appear to have the opportunity to gain market share from the public sector banks. Domestic companies involved in cement, power transmission and consumer franchises also look appealing. Prime Minister Modi has instituted reforms that should strengthen India’s economy and help drive corporate profits. While implementation of these reforms has been challenging and disruptive to businesses and consumers, they are the bold strategic measures to ensure India’s long–term growth prospects. A new bankruptcy law should create a healthier and more efficient credit system, as it will force banks to more quickly recognize bad loans. A national identification system will bring millions of people into the formal financial system, creating opportunities for private and state–run banks. Meanwhile, the national sales tax system should ease the cost of doing business by eliminating a labyrinth of state taxes; it should also help boost India’s tax revenue base. Speaking of reforms, what is your view of China? Stability for China is a good thing. It’s also beneficial for the global economy and sectors like natural resources, given China’s size and influence. In the most recent Party Congress in November, President Xi Jinping consolidated his power to a level not seen since Chairman Mao Zedong. He is now boldly implementing economic policies and reforms that will impact China in the decade to come. I expect Xi will continue to drive the transition to a consumer–led economy, expand infrastructure and connectivity, seek to consolidate the state–owned enterprises into more commercial national champions, improve pollution, clean up the shadow banking system, and continue to root out corruption. The three big risks I see in China are the high debt levels, a potential trade war with the U.S. and aggressive regional expansion in the South China Sea. This communication is strictly for the confidential use of the recipient, solely for the purpose for which it is provided, and may not be disclosed or circulated to, or relied upon by third parties. Past results are not predictive of future results.